Recently I played with Open vSwitch and it’s awesome! Open vSwitch is a multilayer virtual switch and it brings a lot of flexibility in the way you can create interfaces and bridges in Linux. It’s also a Linux distribution independent way to configure these things. Switching in software! We’ll create a new bridge and add a vxlan interface that connects to the other vswitch. Then create a port on it and assign it an ip address. 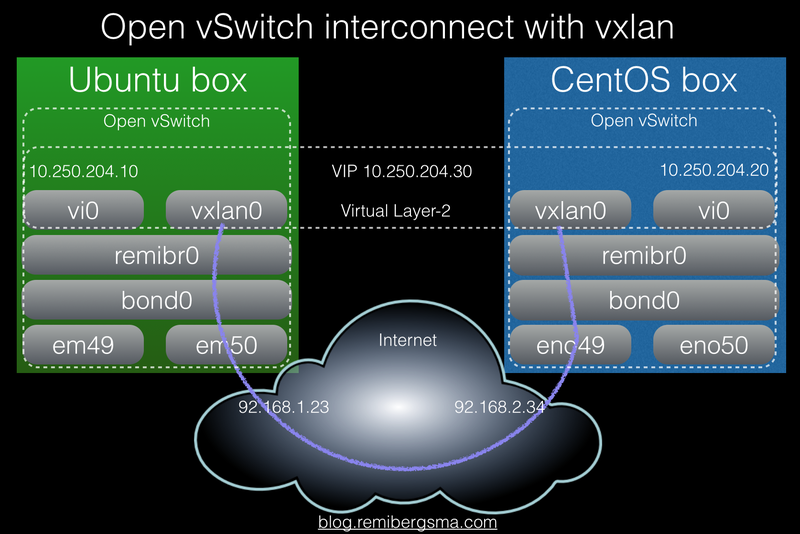 Installing Open vSwitch should be simple, as it is included in the releases. Create the configuration and be sure to fill in the right ip addresses. On the second box, bring up 10.25.204.20/24 on vi0. As you can see, I used different versions on purpose. You can use two boxes that are the same, of course. PING 10.250.204.20 (10.250.204.20) 56(84) bytes of data. PING 10.250.204.10 (10.250.204.10) 56(84) bytes of data. To make the demo a bit more advanced, let’s setup a virtual ip address on the interfaces that can travel between the switches. We use keepalived for this. Copy the config to the other box, be sure to have on MASTER and one BACKUP. Also, the priority of the MASTER should be 200 and the BACKUP 100. It’s just a demo, all it does it bring up an ip address. Start them both and they should discover each other over the vi0 interfaces on the connected vswitches. PING 10.250.204.30 (10.250.204.30) 56(84) bytes of data. Now start a ping and stop keepalived, then start it again and stop it on the other side. You’ll miss a ping or two when it fails over and then it will recover just fine. vxlan is encapsulation and this obviously needs space in the packets send over the wire. If you travel over networks that have a default MTU of 1500, it may be wise to lower the MTU of the vi0 interfaces as this will prevent fragmentation. Lowering the MTU is a simple work-around. You could also have a look at GRE tunnels instead. You can make this persistent in Ubuntu’s ‘interfaces’ file and add ‘mtu 1400’. Red Hat alike systems have ‘ifcfg-*’ files for each interface. Add ‘MTU=1400’ to them to alter the MTU. Although this is a simple demo, the real power comes when you use this to connect two different (virtual or physical) networks in different data centers. You’ll be able to create a Layer-2 network over Layer-3. It’s simple, fast and awesome. Hello! Thank you for this post. I have a problem in the first part of your post. I created 2 virtual machine with virtualbox (ubuntu 14.04), where I installed OVS. I made the same configuration as you but the ping 10.250.204.20 and reversed fail. Hard to tell from here. Is the OVS kernel module loaded (reboot is easiest) and what does the log say? I have implemented tunnel between two VTEP using vxlan virtual port and VM at both side of VTEP are able to ping each other. i want my vm should able to connect Google.com, how do i do that ? The same steps I have done like you, ping is work with vni, but iperf doesn’t work, I don’t know why? Please I connected two openvswitches to each other in gns3vm. The management interfaces are connected to the VM and receive Ip addresses via dhcp. I connected two routers to OVS 1 and I can ping both via OVS1. I connected a third router to OVS 2 but I cannot ping from that router to the routers on OVS 1 or vice-versa. Please what do I need to do on the interfaces of connecting OVS1 and OVS 2 to ensure that i can ping through. Your assistance is greatly needed. Thank you for your post, I have copied it and have a successful vxlan up and running between 2 machines. I can ping one from the other, however, when trying to ssh I end up with a timeout. Question: Is there a way that you know of to use ssh over the vxlan tunnel directly without having to use the -J option and specify the remote ip address?